I had an absolutely wonderful weekend in Mont Tremblant! I'm so glad that I decided to "race" despite my stress fracture. Don't worry, the spoiler alert is that I didn't finish the race, because I didn't want to risk running. Pre-race day: The Ironman Mont Tremblant organizers put on an extremely top notch event. They have a gorgeous location to work with and pull out all the stops to make sure that the event is a great one. As Meredith Kessler put it, it's a "luxury course" and the weekend did feel quite luxurious. On Friday morning, I went for a pre-race shakeout ride along the Petit Train du Nord, a lovely bike path. Then, I went down to the race site with a friend to pick up our bibs and wait for the rest of the gang. We were the first ones in line for packet pick-up and the first ones to wander through the race expo. After a few photos in the village, I was on my own to wait for my friends and explore. I took the cabriolet up to the top of the village, then wandered back down, stopping for some beet juice and a delicious quinoa salad. Once everyone else arrived, we got settled into our lovely condo. It was just up the hill from the race site and even had a great view of the T-Zone. All the Saturday racers attended the pre-race briefing, then packed their bags for race day and checked over their bikes. We made a big family style dinner of chicken, kale salad, rice, and roasted sweet potatoes. After dinner, I did my pre-race ritual of painting my nails. This time in Essie "Boom Boom Room" and "Jazzy Jubilee." We got to bed a bit late, probably because of all of the excitement of the weekend! Sunset over the T-Zone, view from our condo! Going into race day, I had already adjusted my expectations and wrapped my head around the fact that I wouldn't be finishing the race. It was a tough pill to swallow at first, but the priority race of the summer is Worlds, and I didn't want to jeopardize my recovery to run in Tremblant. 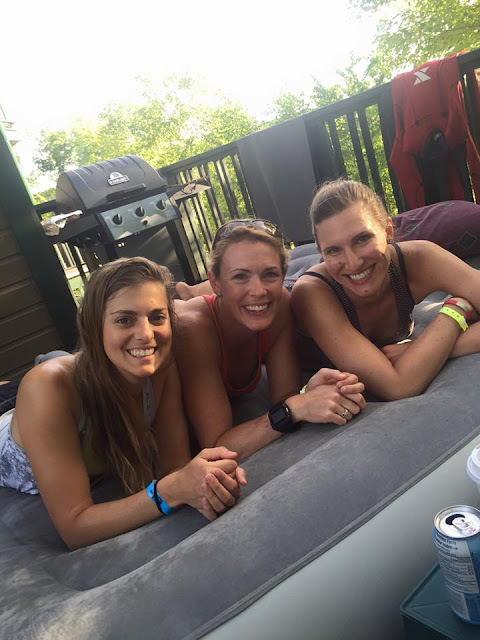 My focus instead was on my friends and on my mom, who was also competing in her very first triathlon on Saturday a few thousand miles away in Saskatchewan. Of course, I was hoping for a good swim and bike to give me a bit of a confidence boost and to see where my fitness was. We got up around 5 a.m. in order to have plenty of time to eat and get our transition ready. My breakfast was my usual oats with protein, almond butter, banana, seeds and nuts along with a coffee (with cream this time). We changed and trekked down the hill to the T-Zone. Setting up my spot was a bit quicker than usual, since I didn't need my run gear. After body marking, we made our way over to the swim start. It was an absolutely gorgeous morning. In the weeks leading up to the race, I was pretty nervous about the water temperature, but after braving a "warm-up," I was pleased to discover that the water was cold, but quite pleasant. It was also calm and the conditions looked perfect for our race. The fog hanging over the other end of the lake gave a majestic air to the already beautiful scene. Gillian came down to the start with me and snapped a few pre-race photos and I ran into Dale at the start as well. Before I knew it the men were off in the water, and we were lining up on the beach. My plan was to get into the water and swimming as quickly as I could, despite the fact that I needed to walk into the water. Luckily it became deep fairly quickly so I was able to start swimming and make my way to the front of the pack. I took a pretty early lead and settled into my stroke. Soon, I was catching up to the wave in front of us and had to start avoiding the men doing breast stroke. I was trying to stay close to the buoys and not get kicked in the face, so I found myself sighting a lot more frequently than I normally would. After turning toward the swim exit, I was blinded by the sun and could hardly see anything, so I just looked for lime green caps and followed them toward what seemed to be the exit. To avoid having to walk too far, I swam until I was dragging my hands in the sand, then stood up and began the looooooong WALK to transition. My swim seemed quite slow for me if the course was actually 750m, but after looking at the men's times (fastest was only 10:52), remembering that I walked to the timing mat, and realizing that I had not only the fastest women's time, but also the third fastest time... I decided that I was okay with my swim. Well, walking 300m to transition totally sucked, I have to admit. Nothing like having all those people you worked hard to pass, run by you as you walk. And the lovely fans cheering were all giving me fairly puzzled looks. They were shouting, "You're the first woman," and "Run!" and "Go! Go!" And I wished I had a sign that said in French and English: I can't run / Je ne peux pas courir!! Anyways, a few girls, including Dale, raced by me into the T-Zone and were already off on their bikes before I even got to mine. Once I got to my bike, things went pretty smoothly and for the first time ever, I successfully put my shoes on while pedalling. Duplessis is a monster. I knew that going into the race since I had a few opportunities to bike it in the previous weeks. Coach and I discussed a game plan for tackling the hills, maintaining energy, and taking advantage of the downhills. It was a bit harder to execute, given the crowded course and what seemed to be a lack of respect for the drafting / passing / blocking rules by many of the riders, plus my fear of pushing too hard on my injured leg. So, I attacked the three big hills by spinning up them with a high cadence and tried not to get stuck behind the guys as they slowed down at the top. In the end, I definitely could have pushed harder, but I'm sort of glad that I didn't since my time didn't really matter, but staying in recovery mode and not injuring myself further does matter. The way back to the village was a lot of fun for the most part, and I hit some fast speeds coming down Duplessis. As I crested the last "party pooper" hill (18% grade at kilometer 18), I reminded myself that this was it, the race was pretty much over and I could use up the last of my energy in the last 2k toward T-zone. That was the best part of the race, realizing that there was absolutely no pressure and that I could let loose and enjoy the end. I hit just the top of my goal time (was hoping for under 45). I got my feet out of my shoes while pedalling and dismounted. As I walked into the T-Zone, I looked for an official to give my chip too. He also reminded me that I needed to leave my helmet buckled next time. In my excitement to be done, I had unclipped it, remembered immediately that it needed to stay clipped until I racked my bike, but then couldn't do it up with one hand. Anyways, my race was over. I left my bike, put on my running shoes and walked to find my friends who were cheering for those still racing. A somewhat anti-climatic finish to my race was quickly forgotten as I cheered on Dale to her finish. She ended up winning the Sprint as first overall female! All of my friends had an amazing day and it was exciting to hear about their adventures on the race course. I'm so proud of all of them for all of their hard work!!! On Sunday, I got to experience my first Half Ironman event cheering on my friends from the Ottawa Triathlon Club and beyond. It was incredible. I am completely in awe of those who raced and so happy that I got to witness their amazing performances. Seeing the pros race was a lot of fun - go Meredith Kessler!! And then, my friend Gilly punched her ticket to go to 70.3 Worlds!! So proud of her! While I definitely experienced some disappointment and wished I could have finished my race, I'm also really glad that I decided to participate in the weekend in the way that I could. My swim and bike went well and I got to have that race day excitement. Sharing the experience with my friends was the highlight and I will have great memories of the weekend. 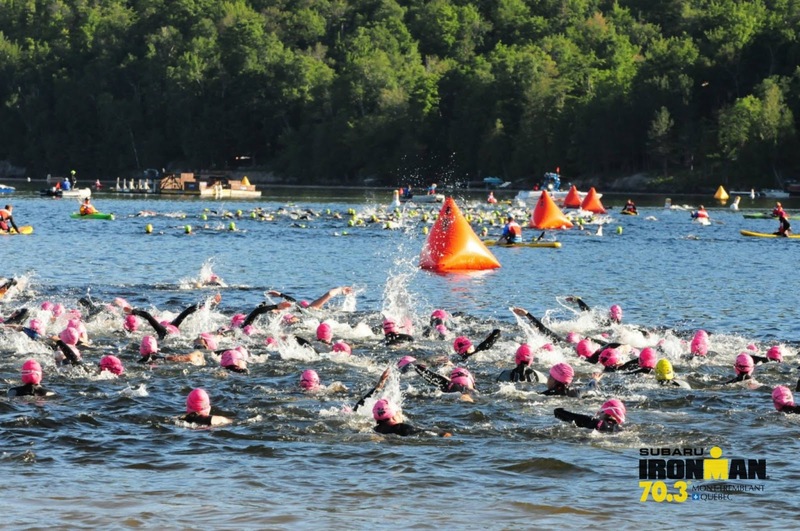 It was a lot of fun and I definitely will be back to race in Tremblant again! A special thanks to Coeur Sports for my amazingly comfortable and gorgeous team kit, to team sponsor ROKA for making awesome goggles, and to Osmo Nutrition for keeping me hydrated all weekend! Fun report! It is awesome that you participated to the extent that you could and had great times and good fun! I have heard so many great things about MT and I think that if I ever decide on another full IM, MT would be on the list to consider! Well done lady! I missed that you put your shoes on while riding - wicked! Thanks for the shout out, we are super proud of you. Let's get you healed and to worlds! I love that you turned a negative stress facture into a positive weekend and great event for you. I love you and thank you for turning me on to the world of triathlons. My first one was very exciting. Great report! I am so glad that you had an awesome swim and bike!! Good job on sticking to your plan and not running. I can imagine that was a hard decision but you will recover faster and not injury yourself any more!!! 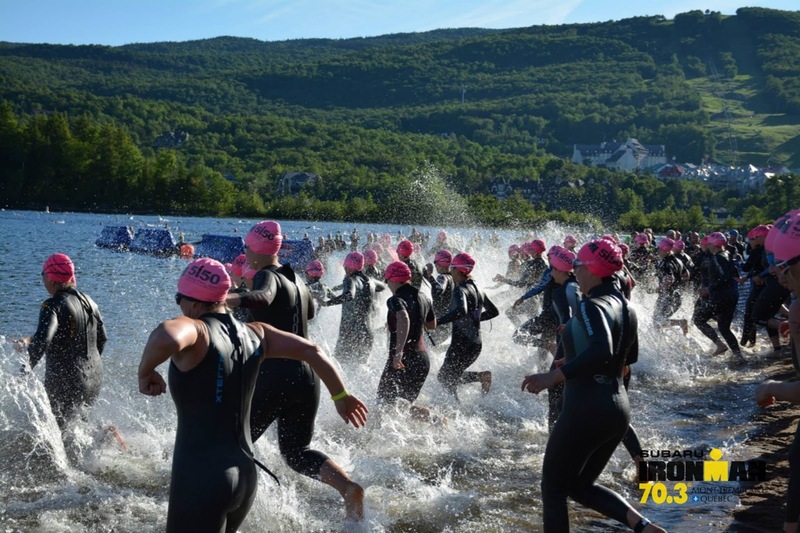 How did your mom get on in her first triathlon?